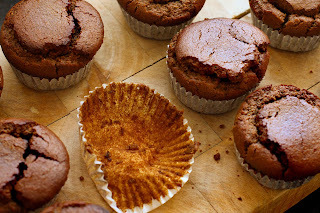 These little cakes of joy turned out to match my personal muffin preferences to perfection! They are super soft on the inside with crispy edges on the top. 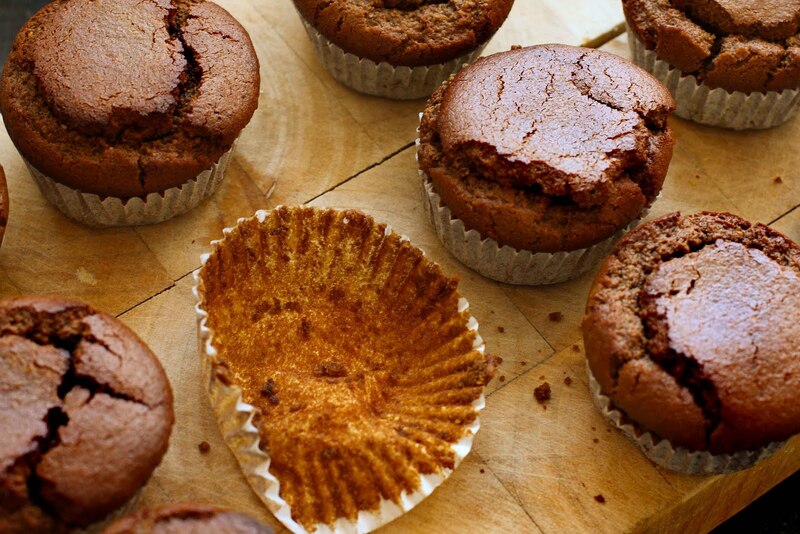 I’m not sure if the tops of muffins are traditionally supposed to crack as much as these do but it’s my favourite part whether it’s ideal or not! My only word of warning is that due to their extreme softness be sure to use a toothpick to ensure they are baked all the way through and let them cool in the pan for a few minutes before removing them… and do be gentle. Taste best on the same day of baking. I especially love them when they are still warm from the oven! In a small bowl mix the sunflower oil, flax seeds and vanilla and set aside. In a medium sized bowl combine the rice flour, tapioca flour, baking soda, baking powder, salt and ground almonds together. Add the molasses, Manuka honey, rice milk and the flax, oil & vanilla mixture and stir thoroughly until all ingredients are well combined. 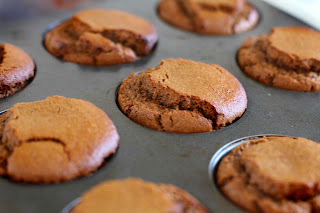 Line a muffin tray with muffin papers and pour the mixture evenly between the cups filling to just under the rim of the paper liners. Bake for approximately 20 minutes. Test with a toothpick to ensure that the muffins are fully baked, (bake for longer if necessary - until the toothpick comes out clean). The muffins should rise above the papers and crack on the tops forming crispy edges. When fully baked remove from the oven and let stand for about 5 minutes before removing them from the pan. I find it best to gently twist and then lift them out with the aid of a butter knife. Eat as soon as they are cool enough to not burn your tongue! –Best enjoyed on the day of baking, but if you can’t eat all 12 in one go, store in a dry airtight container once fully cooled. 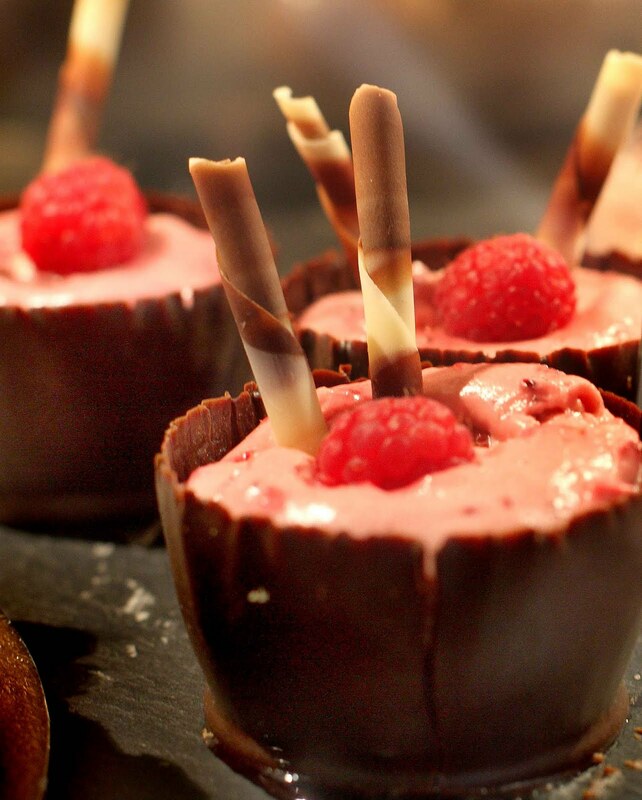 And of course, the main feature of the ground floor is the Food Hall: There are so many different products that you will uncover such as Booja Booja Ice Cream and Murphy’s Mango Sorbet which are both Dairy Free, Gluten Free, Wheat Free, Egg Free, Soya Free and Vegan (Booja Booja’s Vanilla M’Gorilla is also raw). 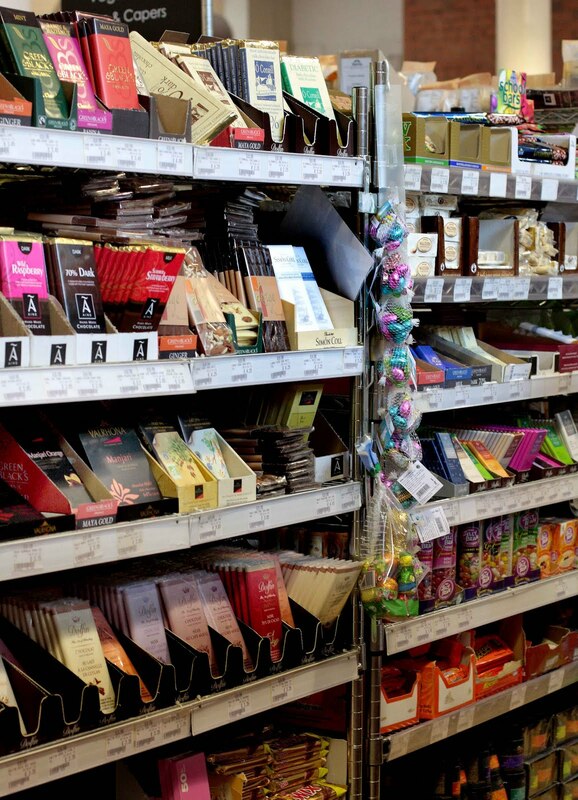 Or perhaps you will fall upon the fabulous luxury chocolate section which is seriously extensive and full of dairy free, gluten free, wheat free and vegan options if you just take the time to uncover them. 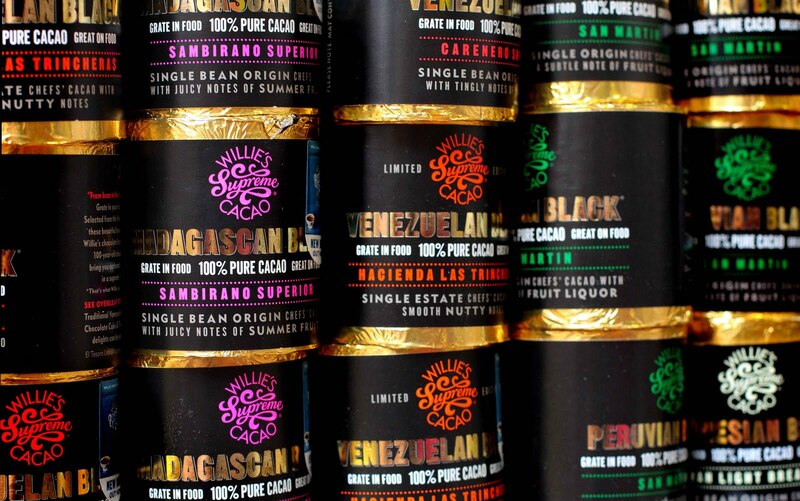 - Willie’s Supreme Cacao, for grating or melting or whatever! – free of basically everything other then er, chocolate, which means caffeine! - Hale & Hearty Gluten Free Breadcrumbs & Allergy Friendly Crumble Topping. Other allergy friendly foods/products stocked in Fallon & Byrne which might be of interest are Yeast Free and Vegetarian Stock cubes, Mrs. Crimbles range (flavoured rice cakes, cheese crackers, macaroons, dutch apple cake, brownies, stem ginger cake), LI Organic Linseed bread, Ener G gluten free, wheat free, soya free, dairy free, egg free, potato free, vegetarian, vegan, kosher bread loaves, Sunrise Seaweed Natural Rice Crackers, Doves Farms Gluten free & Dairy free corn flakes and Gluten Free, Wheat free, Corn free, yeast free Cereal Flakes as well as their Hazelnut and Lemon Zest Cookies Rude Health 100% Puffed Wholegrain Rice cereal, QI Quinoa Bread (note: not vegan due to honey in the leavening process), PzBu Gluten free, Dairy free & Yeast free Pizza base, Delicious Chocolate Tiffin & Macaroons, Hale & Hearty Porridge. The Worldwide Vegan (Dairy Free & Egg Free! )Bake Sale in Dublin – Take Part May 7th! This spring marks the 3rd annual Worldwide Vegan Bake Sale. The Bake sale is organized by different groups in loads of countries around the world from Canada and the USA to Taiwan and Uganda! For a full list of participating countries and cities please see the bottom of this log. 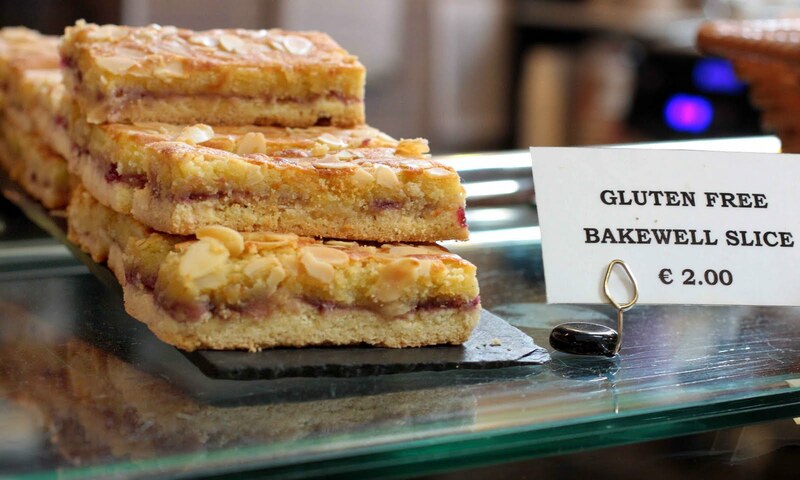 The Worldwide Vegan Bake Sale is happening everywhere between April 22nd – May 1st but for some reason Dublin is being a bit tardy and not hosting their bake sale until Saturday May 7th 12pm – 2pm . The sale will take place in Temple Bar in the Dublin Exchange, which is a collective art centre on Exchange Street Upper and all proceeds will be divided between the Vegetarian Society of Ireland (to put towards World Vegetarian Day 2011 and The Irish Vegetarian magazine) and World Vision Ireland's Haiti Appeal. And all of this of course means Dairy Free, Egg Free, Vegetarian and Vegan baked goods which will not only delight your taste buds but will also help a good cause! So put aside a few extra Euros for some baked good splurging coming up soon! I know that half the battle of living food allergy free (for me at least) is going into shops where the shelves are stocked with countless beautiful, tasty looking products which are filled with my problem food allergens. This, highlighted with the power of marketing and package design, can make your weekly shopping experience extra hard, as if it wasn’t hard enough to begin with! One defence is to never go shopping when hungry (I tend to save money that way too!). The other would be to shop in a shop where everything that was sold was food allergy friendly. This probably seems like a mere pipe dream for anyone with allergies but I promise you it’s not! 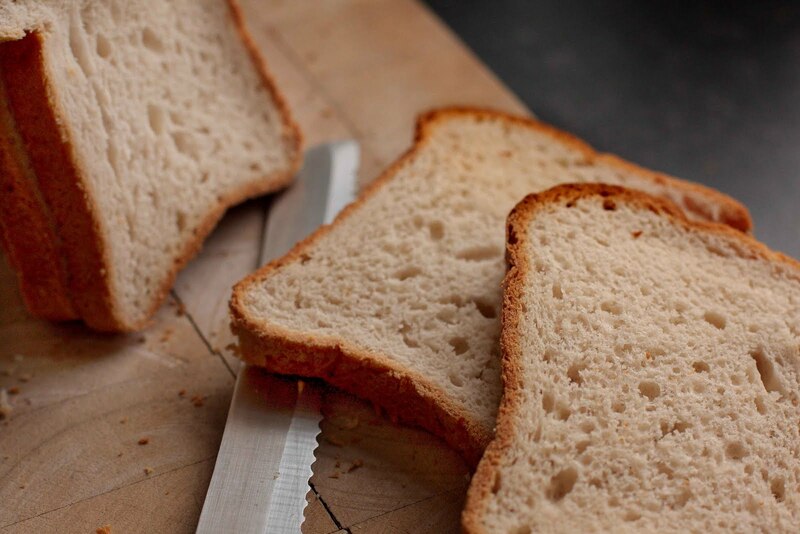 For a next-day delivery of fresh bread call 01 620 5053. 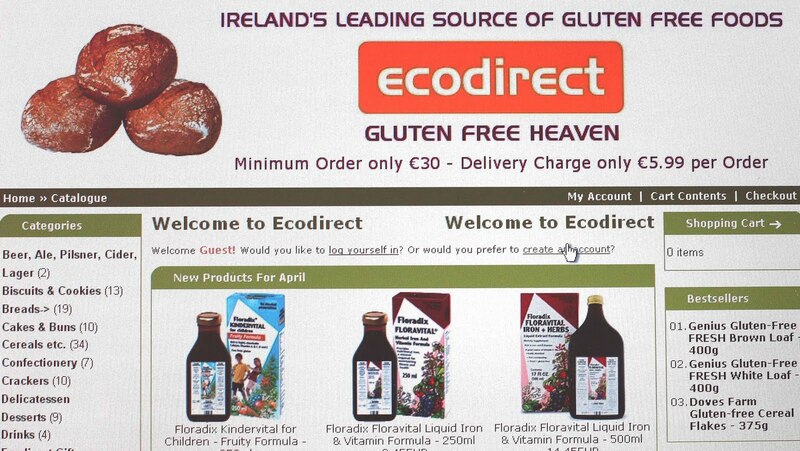 One of the things that I really appreciate about Ecodirect is that they ‘do not stock products containing Spelt, Kamut, etc.’ because if you need to follow a strict gluten free diet then you are probably familiar with the disheartening feeling of seemingly ‘gluten free’ products which contain these ancient forms of wheat. That is not to demerit these grains in any way of course, but it should be recognized that not all gluten free and wheat free diets can tolerate even these ancient forms. 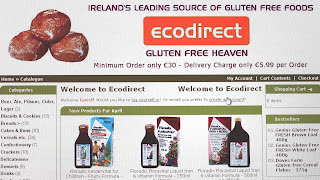 Note for multiple allergy sufferers: The other hugely brilliant thing about Ecodirect is that most of their products list all of the ingredients online – nirvana indeed! So it is very possible to browse the virtual shelves at home and only buy what you can actually eat! 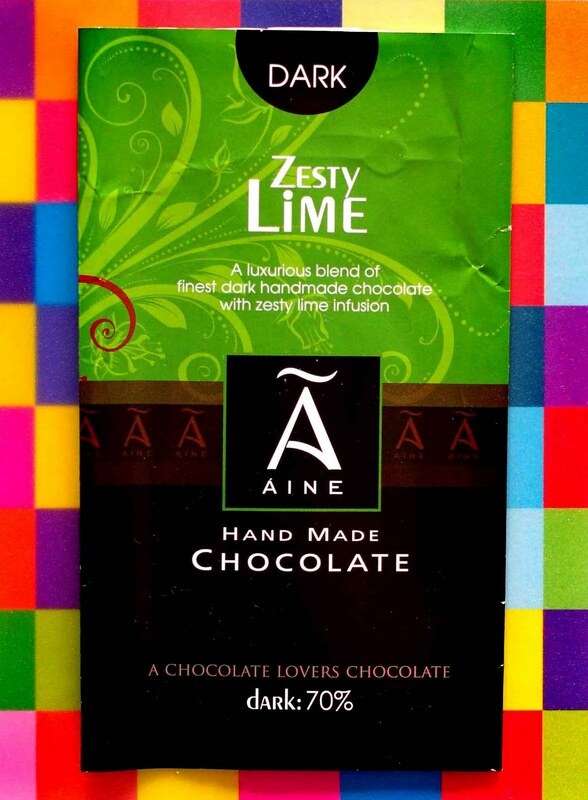 70% dark chocolate with flakes of zesty lime flavour. This is a strange chocolate flavour to come by but it really is quite lovely and seems to be gaining in popularity with chocolatiers. The lime flavour reminds me of a favoured lime filled hard chocolate coated sweet we used to get in Canada years ago which also happened to be dairy free so top marks from me on taste and nostalgia! Another quality about this bar that I really enjoy is how the bar chips away in layers... again, this may sound strange but I have always loved eating food which has little oddities like this… As the ‘flavour and filling hog’ that I am I would love if there were more flakes of ‘zesty lime’ but even with the present amount it is still some pretty good stuff so tuck in all you dark chocolate fans. 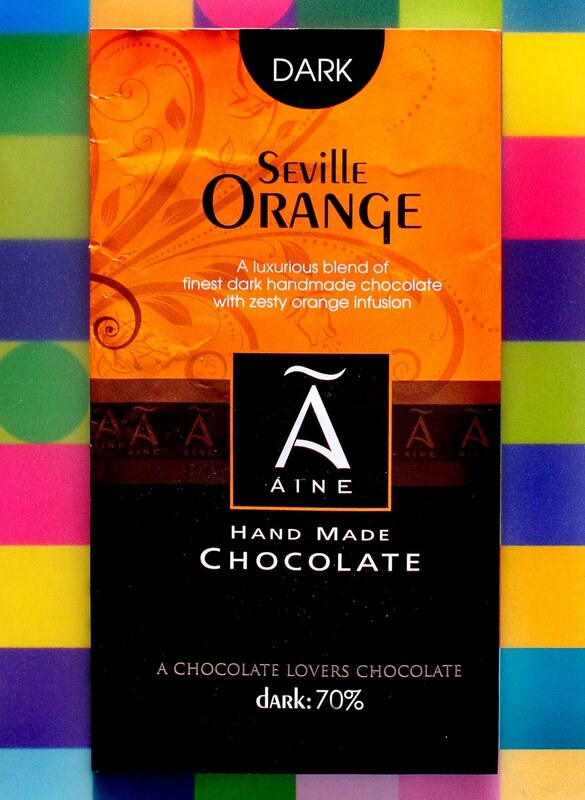 Available in Superquinn, Fallon & Byrne (on Exchequer St, Dublin 2) and online www. chocolates.ie. Other Dairy free & gluten free flavours available from Aine Chocolates are Mint Crisp and Roasted Hazelnut (all the dark chocolate flavours except the Wild Raspberry are dairy free). 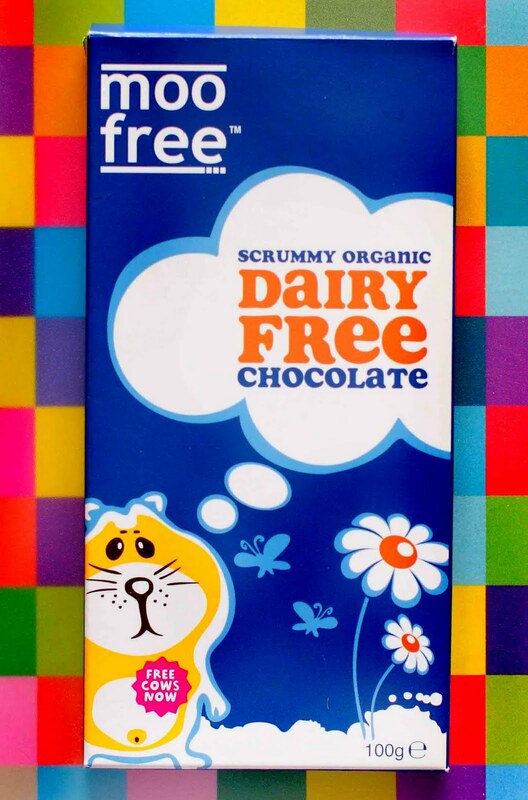 Moo Free is popping up everywhere lately and it’s a good thing because they are some of the few ‘faux milk’ chocolates on the market which are also soya free! I wrote about their Easter eggs on The Easter Bunny Can Lay Dairy Free, Soya Free & Gluten Free Eggs!. The chocolate bars are generally the same idea. Affordable at under €2 (although I’ve noticed some severe price differences between stockists) and as good as any of the popular milk chocolates. Moo Free is quite sweet if you’re not used to mainstream sugar levels but it’s a good substitute…so good in fact that you might forget that it’s a substitute! Moo Free were even shortlisted for 3 Free From awards this year! A couple places you can pick one up is in Rathmines’ The Hopsack and Terenure’s Nolan’s FoodFare. Ingredients: organic sugar, organic cocoa butter, organic rice powder, organic cocoa mass, emulsifier: sunflower lecithin, natural flavouring. Contains cocoa solids 42% min. A guaranteed Nut free chocolate (which can be hard to find!). 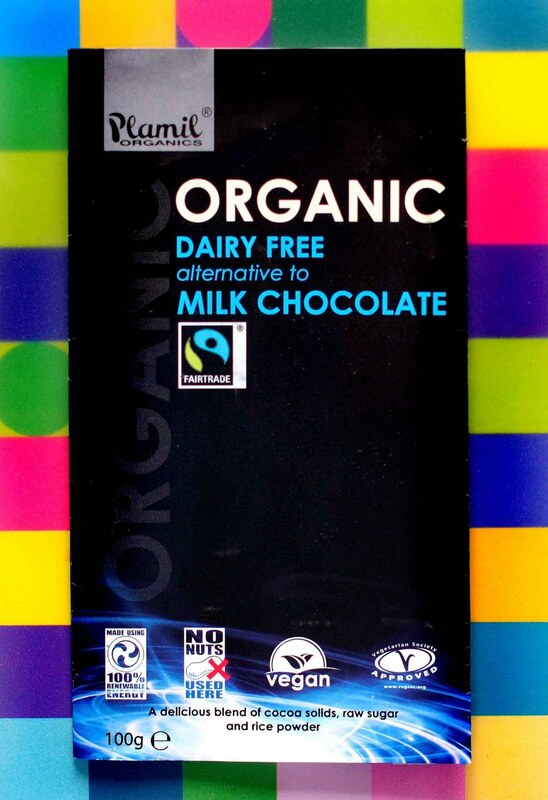 Similar to Moo Free chocolate in that it is also one of the few dairy free ‘milk’ chocolate bars which is also soya free. Plamil have a large range of chocolates www.plamilfoods.co.uk among which you will find dairy free dark chocolate and even dairy free & sugar free dark chocolate in one. They were also crowned ‘Top Ethical Brand’ in 2009. You can find Plamil products in most healthfood stores and a full range of the chocolates can be found in The Sweet Life in Georges Arcade. Another Irish brand coming from Carrigaline, Co. Cork. I came across Ó Conaill the other day in Fallon and Byrne and was delighted to see their Irish nationality and gluten free and dairy free claims! 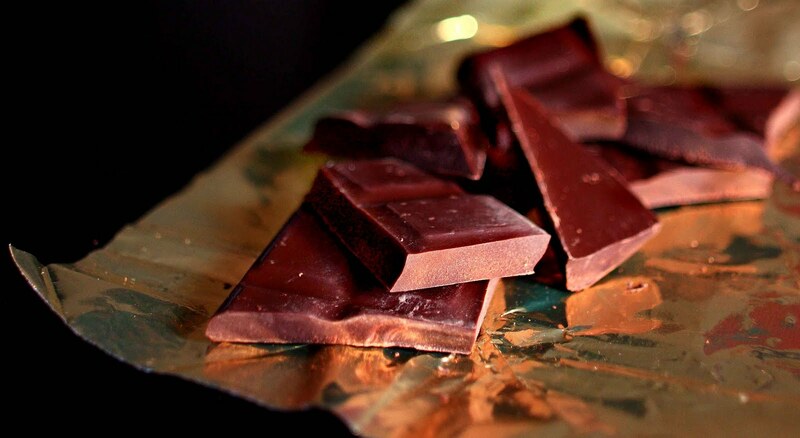 The dark 70% bar is some pretty heavy duty stuff so definitely one for Dark chocolate lovers. Even I can’t eat it all in one sitting which is rare…. but I’m working on it! 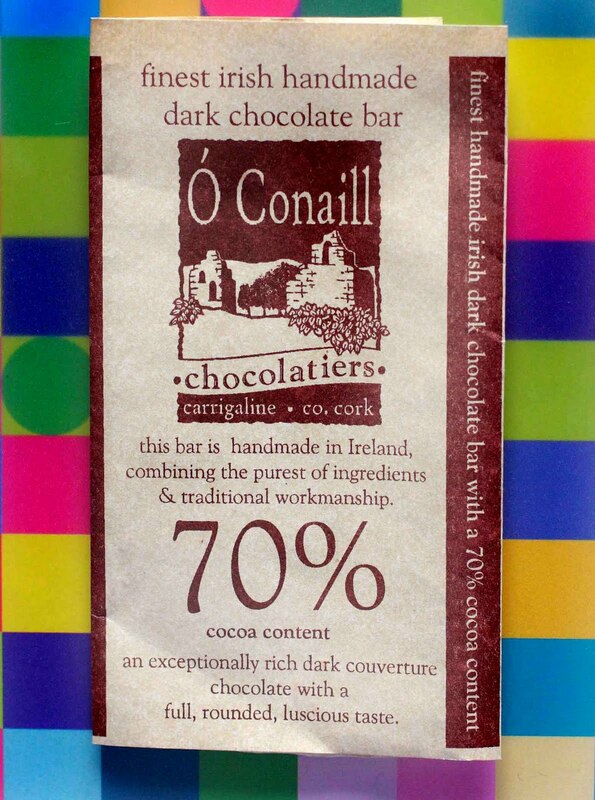 Ó Conaill chocolate is all handmade and uses traditional methods and I must admit that with the brown paper and gold foil wrapping I feel like a Victorian child with my first chocolate bar which is great fun! There are two sizes of the 70% bar of large and extra large coming in at about €2.75 and €5.75 respectively. 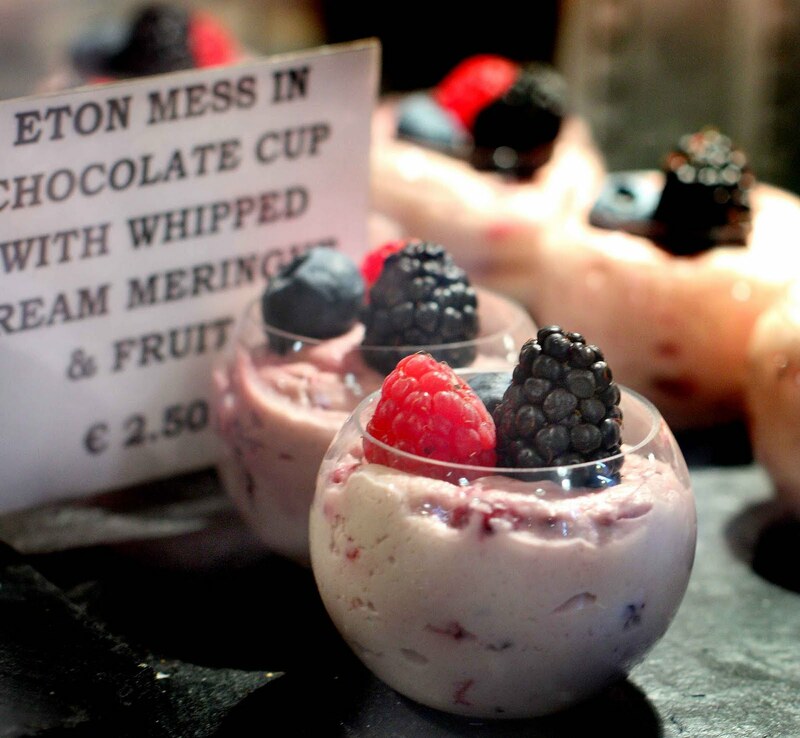 Available in Fallon & Byrne (Exchequer St, Dublin 2). Ingredients: Cocoa butter, cocoa mass, sugar, soya lecithin, cocoa solids 70% min. After weeks of trying to guess the location of F’s surprise mystery city-break I was amazed that his last ridiculously easy hint of ‘the city is literally filled with the sound of music’ was not actually a trick hint and that the location was in fact the infamous and entirely beautiful Austrian city of Salzburg! (On the off chance that you're interested or would like to tempt your travel bugs I’ve posted a couple of my tourist shots at the end of this log). F and I shared a beautiful hearty lentil ‘soup’ (Indische Bio-Linsen mit Bio-Reis und Salat) which was more of a main course and I had a delicious vegan Wurst bagel (Wurst [vegan] Seitan, Tomate, Salat, Senf) with a desert of apple cake made with ‘Dinkel’ which I believe to be either Spelt or similar to Spelt (Dinkel – Apfelkuchen vegan und zuckerfrei) which all tasted so wonderfully healthy and fresh. The waiter, who was extremely lovely, also told me that despite his not being a huge fan of vegan food that the vegan chocolate cake was his favourite of all but that it was sadly sold out for the day – sigh. The best bit was that the whole thing (1xsoup & salad, 2x bagel sandwiches, 1xcake and 1x mango lassi drink) all came to just about €20. Reformhaus Martin was a great little health food shop that we fell upon. Located in the new city (North of the river) on the lower part of Linzer Gasse which is, in essence, the ‘Henry Street’ of Salzburg (for all you Dublin residents). This large health food shop is part of a 20 strong Austrian chain and has all of the food allergy friendly products that you are likely to need during your stay in Salzburg. Among other things I was delighted to see a good selection of dairy free milks, and an entire Gluten free section (gluten frei) which even had Gluten free beer so you don’t have to feel left out … I tried out some really nice Provamel soya yoghurt ‘Lime with Lemon balm’ which I had never seen before and F uncovered some gummy bears made with honey which were a slow burner but heartily enjoyed by the end of the package! There was also a small salad/juice bar in the shop but I didn’t get the opportunity to try it out. - Almost all of the fresh breads seemed to be egg and dairy free (note: not the case with the sweet breads sadly but as expected). - In the restaurant on the hill attached to the Mdm (Modern Museum of Art) you can enjoy a coffee etc. with soya (soja) milk if you like while taking in the glorious view! - The ever popular Ritter Sport Marzipan chocolate square bars which are naturally dairy free, egg free and gluten & wheat free (note: may contain traces of peanuts, walnuts, wheat and dairy products as Ritter Sport uses all these ingredients to make their other delicious flavours). - And last but certainly not least was the infamous original Austrian Neapolitaner wafer chocolates. I LOVE Manner which I believe F discovered to a shocking degree! Manner Original hazelnut neapolitaner, like Ritter Sport is naturally dairy free, egg free and vegetarian but also contains the warning: ‘may contain traces of other nuts and milk solids’. The best value Manner came from the dedicated shop/café on the Residenzplatz where you could get a pack of four for less than €3. And there you could also get the apricot, vanilla and lemon Manner varieties which are all also naturally dairy free, egg free and vegetarian. 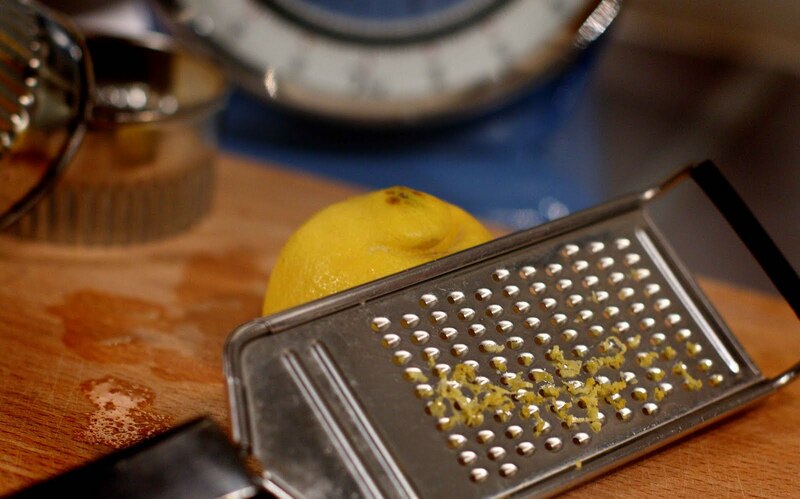 The Lemon ones taste like Jacob’s Lemon Cream Puffs only with more filling! In general people seemed pretty understanding. We even did an out-of-character and ridiculously touristy Mozart dinner concert in the oldest restaurant in Europe, St. Peter’s (serving since 803 AD!) with a set menu and the staff had no problems is altering the menu with a few hours notice to meet my dairy free and egg free needs and F got a brilliant Vegetarian risotto and salad. And up on the northern part of the city we went to a small Italian/Pakistani restaurant (strange mix of cuisine, I know) which happily worked around my needs with no advance notice at all... But then again I suppose that Salzburg is used to every sort of person coming their way with 8 million tourists a year! 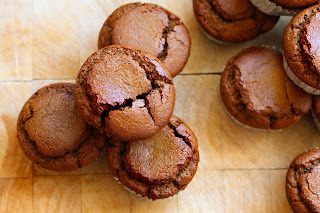 I have been drooling over the Hale & Hearty home-bake mixes lately. I was impressed with their pastas and am quite attracted to all of the packaging (the pictures on the boxes look yum!). The only problem is that we were never a family that bought cake mixes and somehow I have a preconceived notion that any cake that comes premixed in a box is ‘bad’ for you… If we are completely honest here I think that the truth is that cake in general is a bit of a sugar-fest luxury and when you’re talking about a Hale & Hearty food allergy-friendly ‘free from’ cake mix then the balance is a little more favourable! I was delighted with how many ‘free from’ dietary requirements that the mix met and adapting the cake into Dairy free would be no problem at all in my opinion (just substitute dairy free margarine for the butter which usually works a treat) but I must admit that the Vegan recipe seemed to be a little bit of a stretch and unfortunately that was the one we had to use due to my current egg free existence. The regular recipe asked for four eggs and 175g butter whereas the vegan recipe only needed 150g margarine and instead of eggs asked for 150ml water, soya milk or rice milk. We opted for our usual rice milk. Although the cake tasted good it was quite dense. The dairy free ‘butter icing’ & jam filling I made just squished right out when we tried to cut it and the top layer kept sliding around on top! All of this of course was not helped by the fact that I attempted to make a somewhat runny royal icing with the view to pouring it over top and letting it aesthetically dribble down the edges but, despite my Mother telling me over and over again, I still managed to make the icing far too runny so it actually poured right off of the cake and onto the plate. In a desperate act of covering up my head-strong mistake I keep spooning up the fallen icing and putting it back on top so the outcome was a saturated top layer which was far sweeter than intended (note: the cake was already dense before the icing soaked in but you can imagine the outcome!). Obviously I haven’t tried the regular recipe but I do have high hopes for it. I believe that the addition of the eggs would really help the density of the cake and make it close to what was ‘intended’. The flavour is quite nice even without the eggs and the mess of icing and despite the shocking appearance of our cake we were still quite happy to gobble it up. 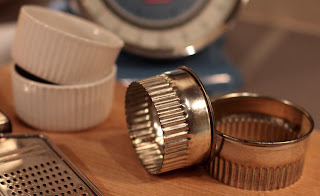 The cake mix is about €3.50 and the full ingredients are: wholemeal rice flour, corn flour, raw cane sugar, baking powder (raising agent: sodium bicarbonate, cream of tartar, cornflour), carob bean gum, pure bourbon vanilla, sea salt. The Sweet Life – Sugar Free, Dairy Free, Gluten Free & Retro Sweets! La dolce vita indeed. 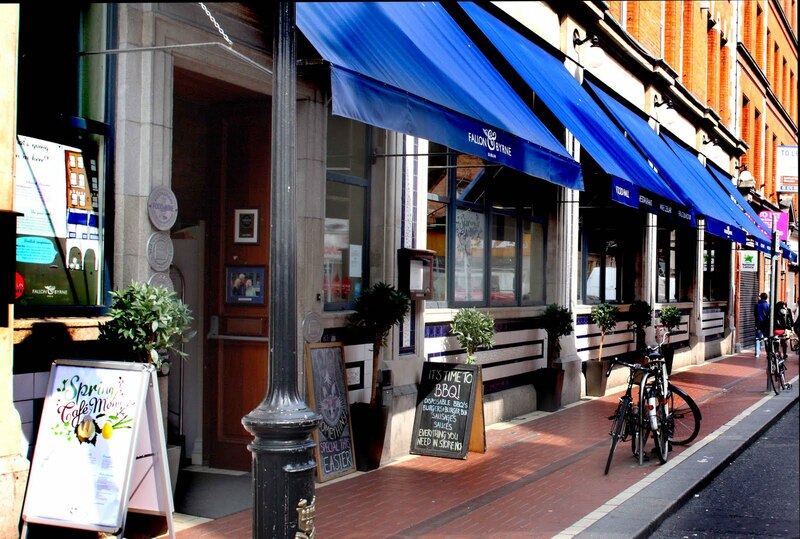 Whether you are visiting Dublin and have food allergies or not you should try to find your way to George’s Street Arcade which is located between South Great Georges Street and Drury Street. 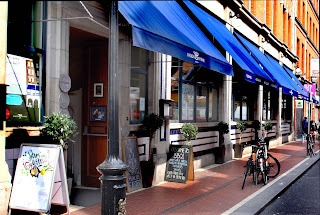 The Victorian George's Street Arcade is one of the more alternative shopping venues of Dublin with great variety and atmosphere. It has been operating solidly since 1894 and has about 50 units supplying everything from retro clothing, music and antique books to cafes, hairdressers and tarot readings - check out their website for some interesting history, location and shop listings. On a more food allergy friendly note let’s talk about ‘The Sweet Life’ which is located inside the arcade on one of the middle stalls. Any passer-by might get drawn in by the lure of brightly coloured sweets which brings on a nostalgia of youth with all the ‘old’ candies and sweets available like Wham Bars, Sherbert Fountain and Mint Crisp but we dietary restricted folk will be drawn in by all the food allergy friendly sweets inside! - Plamil dairy free chocolate bars (orange, milk, mint and sugar free)as well as the chocolate drops which are great for food allergy friendly baking because they are free from dairy, eggs, gluten and soya to name but a few. The Sweet Life also has Stockley’s ‘Cinder Toffee’ which looks like the delicious honeycomb inside of Cadbury's 'Crunchy' chocolate bars. I was quickly glancing at the ingredients and I do believe that they are Dairy free but some things sound too good to be true so you should probably double check before indulging - but I’d almost put money on it! I was also told that The Sweet Life is expecting their ‘Choices’ Dairy free and Gluten free Easter eggs to be arriving any day now so I will be interested to see what they look like too! But if you get dazzled by all of the brightly coloured produce just ask for advice because the ‘sweet keeper’ is very helpful and will guide you through what you can and can’t have. An oddity to note is that the Bon Bons are only sometimes Gluten free. It seems that the supplier is in the process of changing over to Gluten Free (which is brilliant news) and so it depends on which stock is received… I don’t know about cross-contamination in the factory or in the sweet jars in The Sweet Life but the proprietor seems very aware of the needs so maybe just ask if you are in doubt. but don’t forget to Brush your teeth!